Do you know what is a nasal cannula? Do you know what they are used for? Even if you and your loved ones have been blessed with good health, you must surely have seen it in movies and television soaps. It is a thin transparent tube that is attached to the nose of a patient who is shown to be in serious condition. One of the wonders of medical science, this tube provides oxygen to a patient who finds it difficult to breathe by themselves, due to the severity of their medical condition. Nasal Cannula as well as facial oxygen masks are commonly used in healthcare facilities to ensure the supply of oxygen to patients who are finding it difficult to breathe on their own. Patients with respiratory disorders are thus, supplied with the required amount of oxygen through the use of nasal cannulas and oxygen masks. Oxygen nasal cannula however is less intrusive than oxygen masks. As mentioned above, the structure of a nasal cannula is of a thin plastic tube, but it has two small prongs at one end. This flexible tube is placed under the nose, in such a way, that the two prongs are inserted inside the nostrils. 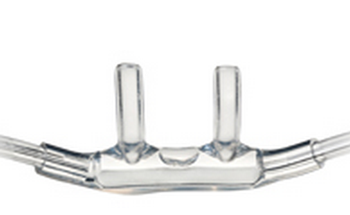 Types of oxygen nasal cannula include flared or straight cannula prongs. Usually, nasal cannulas are used to supply low levels of oxygen to the patient, but in some cases, high levels of oxygen might also be supplied through the flexible tube structure. These oxygen cannula are used for the treatment of patients who have a history of suffering from respiratory disorders and ailments. Nasal cannulas might also be used to administer oxygen to trauma patients in hospitals. Seriously ill patients, who suffer from any chronic illnesses or acute medical conditions like heart failure, are also supplied with the required amount of oxygen, through a nasal cannula. As most patients suffering from severe conditions are unable to breathe properly, and oxygen is vital for the effective working of our bodily functions; nasal cannulas are like little lifesavers that provide a breath of fresh air to the patient, ensuring constant breathing and better sleep as well. The lives of certain COPD patients can also be saved by the constant and effective supply of oxygen through nasal cannulas. How Are Nasal Cannula Used? 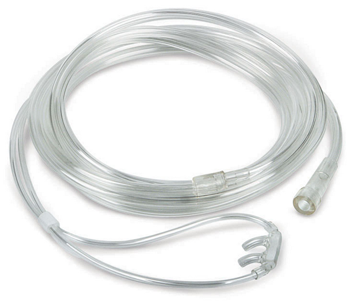 One end of the oxygen cannula, containing the prongs, is placed within the nostrils while the other end is generally attached to an oxygen tank or to oxygen tubing by a oxygen tubing connector that allows a longer "leash" from the oxygen cylinder tank or oxygen compressor. While oxygen therapy might be supplied to a patient through a nasal cannula, in a hospital or clinic; it might also be used to at home or while one is on the go. However, in hospitals, the oxygen tank or oxygen compressor is often placed at the bedside of the patient and remains stable. On the contrary, using nasal cannulas for breathing on the go, requires proper transportation of the oxygen tank or oxygen compressor alongside the patient. Proper care also needs to be taken to ensure that the oxygen tank has sufficient oxygen for the patient to breath easily. Doctors determine the level of required oxygen by taking a blood sample to assess the quantity of oxygen present within the blood. Oxygen cannula are recognized as a primary choice to deliver oxygen to patients. The reason for this preference is because they have a less intrusive application method, and also leave the patient free to speak and eat without any worries. 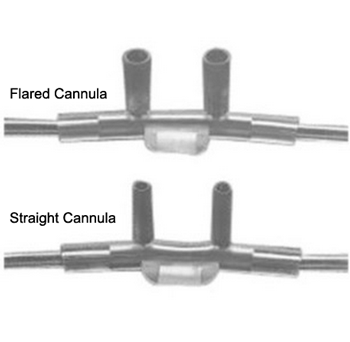 These nasal cannulas are available in a variety of sizes in the market. The Softech Plus Oxygen Nasal Cannula, the AirLife Nasal Cannulas, the Salter Labs Adult Oxygen Cannula and the Cardinal Health Cushion Nasal Cannula are the variety of options available in oxygen supplying tubing, which offer a constant supply of oxygen to a patient with ease. Need a free sample of a nasal cannula? Teleflex offers free samples at their oxygen cannula at following link: Free Samples Teleflex Oxygen Nasal Cannula.